A war diary by Admiral Yi Sun-shin, the naval commander who repelled Japanese invaders in a famous 16th-century maritime battle during the Chosun Dynasty, will be registered as a UNESCO World Heritage asset. The "Nanjungilgi" diary by Yi (1545-1598) has virtually been approved as a UNESCO World Heritage asset alongside records of the Saemaeul Movement promoting rural development in the 1970s. The decision was made by the UNESCO International Advisory Committee on documentary heritage, which opened a two-day meeting in Gwangju on Tuesday to screen rare historical documents for inclusion in the Memory of the World Register. The seven-volume "Nanjungilgi" covers a seven-year span from January 1592, three months before the Japanese invasion, until November of 1598, when he died at the Battle of Noryang Point, the final naval battle in the war. Wartime diaries of distinguished commanders are rare, and "Nanjungilgi" is possibly the only written record detailing naval battles during the Japanese invasion of Korea. The record contains detailed descriptions of battlefield conditions, strategies, climatic and geographic characteristics and the lifestyles of ordinary people. Its concise and flowing style is also highly acclaimed. 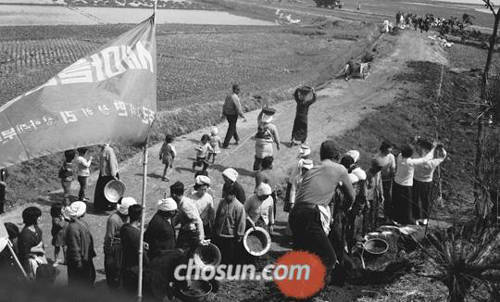 A file photo shows residents expanding village roads in April 1972 as part of the Saemaeul Movement. Meanwhile, it took some effort to get UNESCO to recognize records of the Saemaeul Movement. The IAC asked the Cultural Heritage Administration to cite more specific evidence of the impact of the movement on developing countries. In February, the CHA stumped critics by producing examples of the movement's effects on eight developing countries like Nepal and Sri Lanka. Some 22,000 records include speeches by strongman Park Chung-hee, government documents, letters from village leaders detailing success stories, and educational materials. The movement is seen as a relatively successful example of a government cooperating with villagers to improve the standard of living, apply scientific technologies to farming, pursue innovative thinking and develop leaders. Korea will now have 11 documentary assets on the list. The others are the "Hunmin Chongum" Manuscript and the "Annals of the Chosun Dynasty," both listed in 1997; the second volume of the "Anthology of Great Buddhist Priests' Zen Teachings," and "Seungjeongwon Ilgi," the diaries of the Royal Secretariat (2001); printing woodblocks of the "Tripitaka Koreana" and miscellaneous Buddhist scriptures, and the "Uigwe" or royal protocols of the Chosun Dynasty (2007); and "Donguibogam" or "Principles and Practice of Eastern Medicine" (2009), as well as records of the May 18, 1980 Gwangju Democratic Uprising (2011).